MICHIGAN TRUTH SQUAD ANALYSIS: "Debbie Stabenow's Failing Record" and "Stabenow Is Failing Us"
Hardworking Americans Committee formed in September, listing Ann Arbor GOP consultant Stuart Sandler as treasurer and reporting $1 million in expenditures. With Stabenow showing a consistent lead in the U.S. Senate polls, it could be a boost for her opponent, former U.S. Pete Hoekstra. Stabenow has until recently dominated the TV airwaves, spending $1.1 million from Sept. 17 through October 7, http://www.mcfn.org/press.php?prId=162 according to the Michigan Campaign Finance Network. Hoekstra bought no TV advertising during that time. 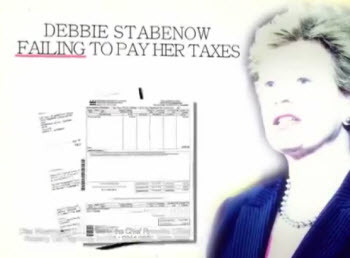 The ads attack Stabenow for supporting spending and tax increases at a time of Michigan economic hardship and for failing to pay taxes on her Washington D.C. home. Questionable statement: "Michigan isn’t the only thing Debbie Stabenow is failing. It seems Stabenow is failing to pay her own taxes on her ritzy Washington, D.C., home." Washington D.C. tax records show that Stabenow purchased a home in 2001 for $390,000. They also show she paid nearly $1,200 in interest and penalties for late tax payments in 2006 and 2007 and 15 cents in 2008. District of Columbia law stipulates that a penalty equal to "10 percent of the delinquent tax and interest on the delinquent tax at a rate of 1.5 percent per month" is charged until the delinquent tax is paid. Tax records show no other late payments or penalties. Stabenow spokesman Cullen Schwarz attributed the late payments to innocent oversight. "When she was made aware of errors six years ago, she corrected them," Schwarz said. Schwarz told Truth Squad that one payment was late seven months and one was three weeks late. Voters can judge for themselves the probative value of Stabenow's personal tax payment history. The record does not reflect that "Stabenow is failing to pay her own taxes" since she has not missed a payment since the 2007 tax year. Questionable statement: "All while raising your taxes 21 times." The statement is a reference to calculations by the Republican-controlled House Ways and Means Committee that President Barack Obama's health care plan raises taxes 21 times. Stabenow counters with an assertion that middle class families and small businesses will receive $828 billion in tax cuts over 10 years under the Affordable Care Act, a statement issued by the Democratic-controlled Senate Finance Committee. It asserts that middle class families, individuals making under $200,000 a year, and couples making less than $250,000 a year, will have a net tax decrease of $588 billion. Stabenow did vote in 2012 to extend tax cuts signed by President George W. Bush for families making under $250,000 and to renew the payroll tax cut. Questionable statement: "A trillion dollar failed stimulus, loans for Solyndra and Obamacare." The statement refers to Stabenow's support of the $787 billion stimulus package passed by Congress in February 2009. In a 2012 report, the nonpartisan Congressional Budget Office noted that the impact of the stimulus was substantially diminished by 2012. But it calculated that through 2013 it would have boosted employment by a low estimate of 1.6 million jobs and a high of 8.4 million. Part of the stimulus package was devoted to loans to clean energy firms like solar panel maker Solyndra, which received a $535 million federal loan. But with rising competition in that market and falling prices, Solyndra filed for bankruptcy in 2011. Republicans assert that the White House ignored warnings of the investment risk in the solar panel field when the Solyndra loan was approved. They also assert the Solyndra bankruptcy underscores the mistake of using government to choose economic winners and losers. Stabenow voted in 2010 to approve what is called Obamacare, a complex package of health care reform that aims to expand health care coverage for uninsured Americans. Among other provisions, it bans denial of coverage for those with pre-existing conditions and allows children up to age 26 to remain on their parents' insurance plan. In 2014, it will require individuals with no insurance to purchase it or pay a penalty. It is often characterized as "government takeover of health care" by Republicans while many Democrats defend it as a long-overdue reform. Questionable statement: "Debbie Stabenow has been failing Michigan for years. With job losses, little growth and record spending all coming under her watch, and with her help." Stabenow has served in the Senate since her election in 2000. During that time, Michigan's economy endured a steep recession with steady loss of manufacturing jobs and the near-collapse of the auto industry. In 2001, according to the Bureau of Labor Statistics, Michigan's unemployment rate stood at 5.3 percent. In 2005, it was 6.7 percent and by 2009 it stood at 13.6 percent, highest in the nation. It has since declined to 9.3 percent as of September 2012. Michigan lost more than 700,000 jobs from 2000 to 2010. The CBO places the federal deficit for fiscal 2012 at $1.1 trillion, $200 million less than the $1.3 trillion deficit the previous fiscal year. Debt rose $4.899 trillion during the two terms of the George W. Bush presidency. It has gone up more than $5 trillion since Obama took office. Spending was setat $1.9 trillion in the 2001 fiscal year budget. Spending for fiscal year 2012 was $3.5 trillion. Stabenow has voted against some budgets during her tenure and for others. For example, she voted "no" on the fiscal 2007 budget and "yes" on the fiscal 2011 budget. Overall impression: The ads accurately state Stabenow's tax history for the home she owns in Washington, D.C. Whether that speaks to her record as senator, voters will judge for themselves. The claim that she "raised your taxes 21 times" with her vote on the Affordable Care Act is countered by analysis that concludes the act will save taxes for middle class individuals and families. It is accurate that Stabenow voted for the stimulus package and that its provisions included a failed loan to Solyndra. While debate continues over the relative impact of the stimulus as a whole, there is evidence it saved jobs. To call it a "failed" stimulus is more assertion than objective fact. It is true that Michigan suffered substantial job losses in the past decade and that federal spending climbed significantly as well. During that time, Stabenow voted for some budgets and against others. But whether there is a contemporaneous link between federal spending and Michigan's economic woes is far from clear. Michigan's economy suffered in large part because it was so closely tethered to manufacturing jobs and an automotive industry that nearly went bankrupt. It is uncertain the actions of a single senator could have altered that equation. Foul or no foul: Foul. The phrase "is failing to pay her taxes" would leave voters to believe she has not paid property taxes and has an outstanding bill. That’s not what the property records show. She was late in the past and did get penalized in the past. A more accurate description could have been "Stabenow has had problems with tax payments in the past." The authors of the ad preferred distortion over accuracy – foul.